Due to an agreement finalized in the last days of 2017, the Palumbo Group is now in charge of operations at fellow Italian megayacht builder Mondomarine. The agreement, approved by an Italian bankruptcy court and labor unions, is just for six months. However, it allows nine Mondomarine employees to return to work as of January 2. 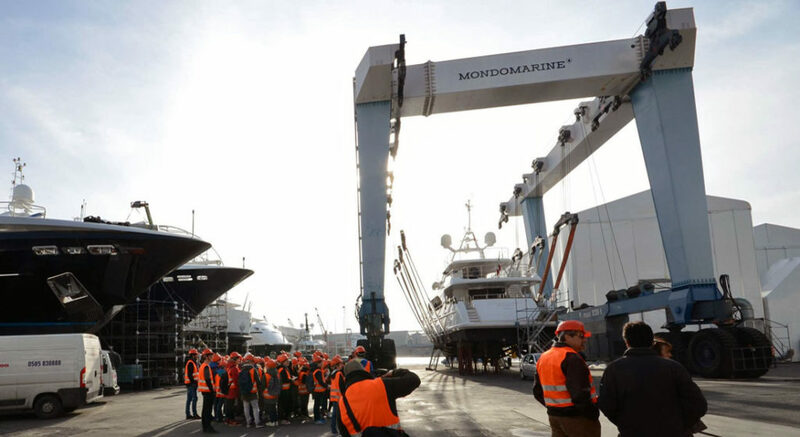 A Palumbo Group statement, quoted by a few Italian media outlets, reads, “With the lease of the business unit of the Savona shipyard, Palumbo Group will guarantee the restart of the shipyards.” (The site that Mondomarine occupied belongs to the city of Savona.) Furthermore, Palumbo Group intends to sign a longer-term deal. In fact, “the objective is to proceed subsequently, following the desired final acquisition, to the reabsorption of a large number of Mondomarine employees of Savona,” the statement adds. According to La Stampa newspaper, Palumbo Group informed union representatives last week that it wanted to absorb 45 employees. However, the article adds, following discussions, the company decided to wait if workloads necessitate it. Mondomarine is in bankruptcy liquidation. This follows a tumultuous year for the former megayacht builder. In March 2017, it laid off 70 employees in Savona and 30 at the Cantieri di Pisa site in Pisa. In July, the management team indicated it was seeking a buyer, to conclude a deal by the fall. This came after an agreement with a Chinese company reportedly fell through. While Mondomarine successfully avoided bankruptcy proceedings during the summer, the board finally relented several weeks ago. Adding to the troubles, Italian fiscal police searched and seized documents from Mondomarine offices in mid-December. A prosecutor is investigating allegations related to fraud, false accounting, and abuse of credit stemming from invoicing for non-existent transactions. Just prior to those searches, Palumbo Group submitted a binding agreement to a bankruptcy court to rent the facilities for six months. Now that it has approval, Palumbo Group is operating Mondomarine as Savona Superyacht. It intends to pursue both refit and new-construction megayacht contracts, too. This complements Palumbo Group’s two existing megayacht-focused brands, Columbus Yachts and ISA Yachts. Even with the promising outcome for some employees, Mondomarine’s ownership and management aren’t out of hot water. The above-mentioned prosecutor has already questioned one executive and plans to have further appear before the court this month.